Here's a gem from today, marketed by Taylor Engley. 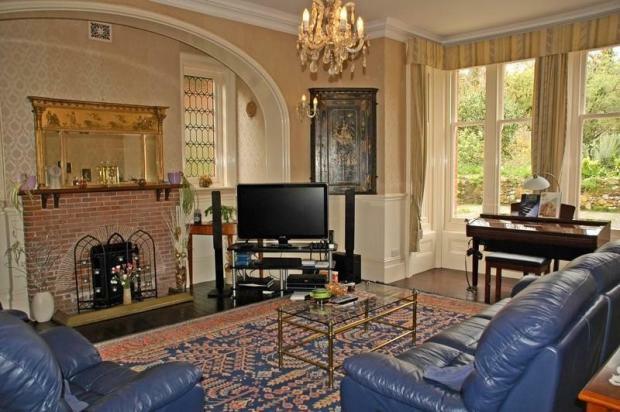 More than half a million quid for a glorified bungalow with what look like pretty boxy rooms. The garden is on a hill, so no use and a pain to keep tidy. I posted it on the main forum, but here it is again in all its glory. Was on earlier this year for £250,000, has been done up (new kitchen, lick of paint) and now yours for £375,000, just increased from £365,000 because it obviously wasn't attracting the right kind of buyer. It's in Meads, which is the nicest area of Eastbourne, but it sticks out like a sore thumb from the nice victorian houses that surround it (and the tower you can see in the pics). It's been under offer once, but came back on today. I don't know quite why, but I see this house as a barometer of sentiment, so if it sells for anywhere near asking, I'll probably give up! Similar story on the other side of Sussex. Lots of higher priced homes just sitting there and for a very long time in many cases. Only those in the just the right location and for a reasonable price (on current comparative) are shifting. A house near me started at £425k nearly a year ago. It's been under offer twice and both fallen through. It's now on for £38750. Just an ordinary bungalow needing modernisation. Yet nearby a pleasant 3 bed detached home, in good state came on for £279,000 and sold within a couple of weeks. PLEASE NOTE THE OECD HAS COMMENTED THAT UK HOUSE PRICES ARE BROADLY 40% OVERVALUED AT THE PRESENT TIME. Well, nice to know someone else has noticed! It is true on a proper comparison against incomes. The prices are currently way over the trend line. Hah, I knew it must have been a developer. I wonder if the flat roof needed repairing, maybe that might account for some of the massive price hike? It's a nice enough house, but it's on the main drag into Eastbourne, which gets very busy. I dunno, if I spend the best part of half a million on a house, it should at least be in a good location! It's been on for a good 2 years and started at £1.3m, then fell to £1.1m and has now just been cut again...I wonder what it will eventually fetch? Come on. Its got twigs in vases so must be worth the money. Great to have an Eastbourne thread as that is my area of interest/obsession and, especially recently, it seems that the reality of the current market here is far removed from the wider experiences and predictions of HPCers. I have been following, and actively participating in, the Eastbourne market since August 2000. The general trends and movements have definitely been in line with the main indices (especially when regionalised to "Outer South East" or "East Sussex") but just recently there has been a disconnection with the Eastbourne market showing extremely limited supply and a lot of house selling for peak prices. Is it clutching at straws to think that a significant turning point has been reached during the past 6 weeks or so...? I think it might be. For reference, the range I look at is from about £370K upwards. My current view is that anything half decent and priced at the current "value" (i.e. hideously expensive in historic terms - around peak to 10% below) is still selling and there is no sense of an imminent sharp downturn in prices. The Estate Agents are far from desperate and, apart from the ludicrously overpriced exceptions, things are selling in reasonable time and at close to asking prices. Good to discuss specific houses on this thread. The one in Willingdon Road on with Andrews must have come back on as it was SSTC. My current bellweather is a house just come on with RR in Uplands Road at £419K. This is expensive for a 3 bedroom house with a modest and sloping garden but my guess is it will sell easily enough. This reposession http://www.rightmove.co.uk/property-for-sale/property-28403401.html was originally marketed at £419K and hat so much interest over that price that it has now come back on at £519K. And this house has just gone SSTC today http://www.rightmove.co.uk/property-for-sale/property-28279657.html . We looked at it and it has a lovely garden but needs plenty of work and is in a very noisy location opposite the university astroturf. As I say (and I would love to be persuaded otherwise) the HPC is definitely not on in Eastbourne at the moment. It feels like things might be heading glacially in the right direction but we are still a way off from getting back to the previous bottom that amounted to 20% off peak in the winter of 2008/9. Is it clutching at straws to think that a significant turning point has been reached during the past 6 weeks or so...? This was one of the areas we looked at a couple of years back (as it has a half decent marina). I have to admit my incomprehension at the massive new build estates that end of town near the Tescos and retail park. Can any of you locals tell me what it is that people do? I'm not aware of any industry in the area and its a fair trek to London on the train (had a colleague that did it though - hour and a half each way - nutter). How on earth do people buy quarter mill houses? Going to be fun in a few years time when the sea comes into the Sovereign Harbour development. I have been looking at Seaford so am interested in local patterns. Can any of you locals tell me what it is that people do? I'm not aware of any industry in the area and its a fair trek to London on the train (had a colleague that did it though - hour and a half each way - nutter). How on earth do people buy quarter mill houses? I often wonder that myself. Eastbourne has a lot of old folks' homes of course, and the usual retail parks, and it also recently featured as one of the top 20 towns most likely to be affected by the cuts so I guess there's a fair amount of public sector stuff here too. There are currently 452 3-bed houses for £260,000 and under (including SSTC) and 338 not including SSTC, so 114 SSTC. Don't know if that's a high figure or not, but I'll try to keep my eye on it for future reference. Many of these houses have been on the market a while, including this one from July 2008! ... but it's £50k more than the maximum for the road, and there are a lot of bigger houses on that road that are also very pretty. I'm unsure whether to get out there and try but am worried about Mrs GG "falling in love with" somewhere and us paying over the odds, given that prices are drifitng slowly downwards. On the other hand, are we more likely to negotiate a decent price now or in the Spring...??? I agree with all of the above but unfortunately I can't see it changing anytime soon by large amounts in nominal terms (which is all that matters to me when considering the timing of a purchase...). I agree that prices and attitudes to borrowing in general are both mental and I suspect that in 20 years time prices in real terms could well be back down to a more sensible level and 50% lower than they are now. Unfortunately, in nominal terms , prices of detached houses in Eastbourne are very likely to be the same or higher in each of 5, 10, 15 and 20 years time - so a long-run waiting game policy can't really work for me...? I'm left with trying to pick the bottom which I feel is likely to again be somewhere around 20% off 2007 prices in nominal terms (35% real terms?) at some point in the next 2 or 3 years. So, if I ever get the chance to buy somewhere nice at 15-20% off peak then I will. I would love it not to be true, and for houses that currently fetch £500K to be available for £350K in 3 years time, but I don't think it is going to happen. You're right, of course, one has to deal with what actually is, rather than what should be. So, with a nod to Sid James: How to spot the bottom ... ? I remain optimistic that this might be achievable sooner rather than later but it needs some hefty falls in the indices and luck with finding a motivated seller. The reality is that little or no impact has come to Eastbourne yet from wider economic factors hitting home. The biggest influence is obviously low interest rates - most people don't have to sell and buyers can afford to take on mortgages. There are still enough people with equity stores from the last 10 years to pay current prices. Mention of Ireland is irrelevant. There are no estates of empty houses in Eastbourne and never will be. I wouldn't lose heart too much. It does have a higher population of old folk than most places, which distorts the market, but there is nothing special about Eastbourne that will stop prices falling. If you look at the lower end of the market (sub £200k), nothing is selling and there are loads of reductions and this will ultimately feed through, it's just a matter of when and how long you can wait. South East down 1.2% in today's LR figures, but East Sussex shows no change. Interesting to look at the Land Registry data for East Sussex broken down by household type. Prices for all types of property seem to move almost precisely in line with each other over the whole of the past 10 years - i.e. figures show no evidence to support anecdotal reports of difference between market sectors. Yes, overall Land Registry for East Sussex was +0.0% for October. This figure should be negative next month and 6 months of avearge 1% drops would do me from here as a start. Hopefully increased supply in New Year/Spring will at least match any increased demand at that time. Highly depressing if you are looking to buy at the moment - absolutely no sign of the market conditions that lead to falling prices or lower offers being accepted. "This time next year, this time next year, Rodders..."
It hadn't sold, only gone under offer and it's already fallen through! Which is consistent with the fact that people can't get mortgages at the moment. Chin up! I want that house to sit there unsold for a while and then for me to be able to buy it at no more than 90% of the current asking price. In the context of a HPC that doesn't seem much to ask, but unfortunately it truly isn't very likely at the moment in Eastbourne.